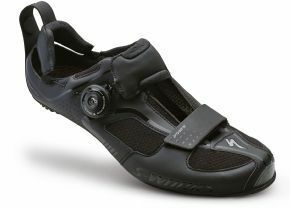 The Specialized S-works Trivent Triathlon Shoes is no longer available, although you may find similar or newer versions below. When seconds count (which is really every triathlon if were being honest with ourselves) your shoes need to get you through the transition quickly. More so they need to deliver maximum performance out on the road. Thats why we designed the S-Works Trivent for the highest level of competition so we can sleep easy at night knowing that theyre the most highly engineered triathlon shoe in the world. There are two kinds of speed in tri—the speed that you can get your shoes on with and your speed out on the road. For the former the Trivent features our revolutionary Tri-Specific Drawbridge closure system that leaves the heel of the shoe popped open and ready for entry in the transition. The Launch Clip meanwhile puts the shoe in the level position for the best flying start possible. And when you combine this with a temperature-regulating construction a stiff and efficient carbon sole and Body Geometry ergonomics you get the total performance package youve been longing for. Now you’re one step closer to your best time ever. > Body Geometry sole construction and footbed: ergonomically designed and scientifically tested to boost power increase efficiency and reduce chance of injury by optimizing hip knee and foot alignment. > Revolutionary Tri Specific Drawbridge closure for the fastest possible time in both transitions (patent pending). > FACT™ 12.0 carbon sole uses high modulus unidirectional carbon fibre and TorsionBox construction to optimize stiffness and weight. > Lightweight Boa® L4 closure system backed by the Boa® Lifetime Guarantee. > Replaceable high-strength braided steel lace. > Arch-mounted Launch Clip for flying starts (patent pending). > Smooth internal lining for sockless riding fit and comfort. > Open tongue design for breathability and drying with toe Velcro® closure. > Light tough and water-resistant Micromatrix upper for supple comfort.